When you do not know how to use your name wisely, the Dark Magicians or the Elite can use it to imprison your body, mind and soul in the "land" of the legally DEAD. The best time to trick you to "live" in the land of the legally dead or the "sea" of the legally dead is on the day your mother gave "birth" to you. The contract that the government used to trick your mother and father to agree to allow you to live in the "land" or "sea" of the legally dead is the birth certificate. This certificate is actually a certificate of a dead baby, which is why it has a legal name written on it. The name or legal name is not you because your are living and made of flesh and blood. For evidence showing that the birth certificate is a death certificate, read my informative article titled The Law and You: How the Birth Certificate is Used to Take Away Your Natural Rights. It is interesting to know that when you look up the word birth in A Dictionary of Law (1889), it tells you to "see Abandon, 2 (2)". The word abandon in section 2 (2) is defined by A Dictionary of Law (1889) using these exact words: "The act of a parent in exposing an infant of tender years (usually under seven) in any place, with intent wholly to desert it." Based on the definition in the previous paragraph, when your mother gave birth to you and your parents signed the birth certificate with your name on it, they unknowingly agreed to abandon you. This allowed the State to claim "you" as its property and ship "you" to the land of the legally dead (legal fiction). Be aware that the word birth sounds almost identical to the word berth. Because they sound nearly identical, a judge or government agent can use them to trick you to think that he is talking about birth when he is actually talking about berth and vice versa. The word berth is defined as "sufficient space for a vessel to maneuver; sea room" or "a space for a vessel to dock or anchor". The process of tricking you to agree to be an artificial person is mostly done through the legal system, which is the system that deals with the DEAD. The legal system is controlled by the Vatican of the Holy Roman Empire, one of the biggest practitioners of magic spells. The legal system is obsessed with magic spells, because certain magic spells have the power to summon the dead. This is why before a judge (also known as a magistrate/magi-strate, which is a magician) demands you to appear in court, a court agent needs to serve you a summons letter. When a court agent serves you a summons letter, the first question he asks you is often related to your legal name, which 99 percent of the time is written in all capital letters on legal documents. For example, the court agent may ask you the question "are you JOHN DOE?" If you were to answer yes to being your legal name and accept the summons letter, you would basically agree to play the role of a dead character. This occurs because the legal name is not living; instead it is a fictitious entity that has no life force of its own. As a result of that, it is as dead as a fictional character in a storybook. The summons letter is used to summon the dead using you (the living man or woman) as the medium. This is why a court agent has to serve you a summons letter with your legal name on it before a judge can demand you to appear in court. To connect the dots, when you accept a summons letter, whether you realize it or not, you agree to raise the dead so you can play the role of a dead character. In other words, you agree to be a zombie. This is why it is called a summons letter. What do witches do when they want to communicate with dead spirits? They summon them using certain magic spells. Have you seen the TV series The Walking Dead? In this TV series, the zombies represent the sheeple who do not even realize that they are legally dead. In other words, from the perspective of the the Dark Magicians, you are the walking dead, get it? The zombie apocalypse is not something that could happen in the future. It is already here because the people are, in a sense, the walking dead! 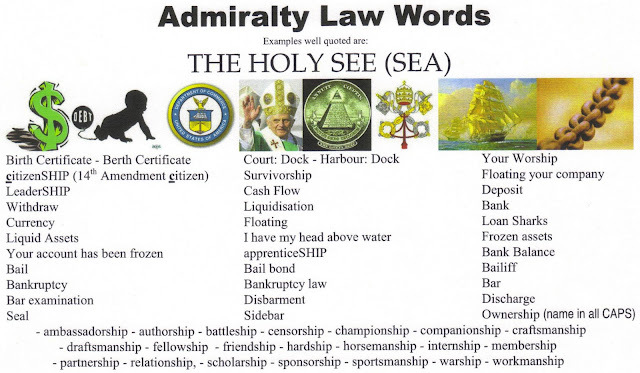 To learn how to free yourself from the land or sea of the legally dead, you need to learn how to use words wisely. Furthermore, you need to learn how to use the power of Natural Law to exercise your natural rights. To learn how to do these things, visit my website EsotericKnowledge.me and become a member. Pao Chang is the author of EsotericKnowledge.me and OmniThought.org. For more content related to the article you just read, visit his websites and read his book titled Word Magic: The Powers & Occult Definitions of Words.